Our daughter Nell, I think her children will some day rise up and call her blessed (proverbs 31:28). We think she is such a good mom. Her four children are a testament to her good nature and patience. Her children don’t always want to help out in the garden, but they always do. The other day we needed to do lots of weeding. Some of the kids were grumbling a bit about it, you know they said things like it’s too hot and it’s too hard. 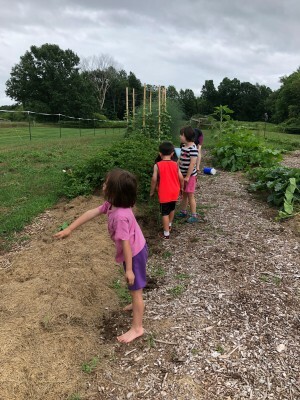 But mom turned it around by turning weeding into a game; 1 point for pulling the weeds and throwing them over the row, 3 points if they get it over the fence. Suddenly they were all weeding and having fun doing it. Her children are far from perfect but Nell deals with them patiently and with an understanding of where they are in their stage of development. She lets them be kids, getting dirty and all the bumps and bruises that come with healthy explorations and adventures. Whether they are up here in the great outdoors or home in their house, Nell uses every opportunity for learning. This year she is home schooling all four children; her 9 year old, 7 year old and 5 year old twins. It’s a big job, but the kids are eager to learn and doing very well. Great job mom! Posted by Maryclaire Mayes on Monday, July 30th, 2018 at 09:33 and is filed under General.